Perhaps the most worrying thing that has happened in the past 24-hours is the change in designated color of the storm moving through the Caribbean towards the Gulf of Mexico. 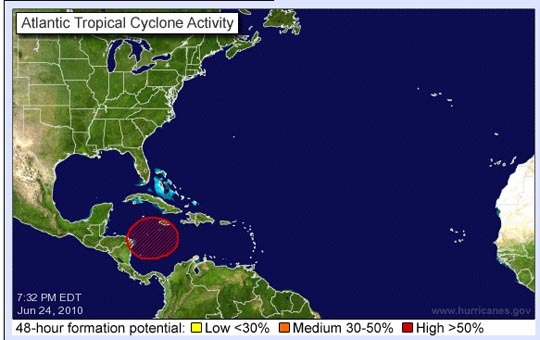 It is not that long ago that the National Hurricane Center had colored it yellow, but now, more ominously it is red. (Which indicates a greater probability of bad weather). This is unfortunate given that it appears that almost all the oil from the well is now being captured. The discussion of this developing problem will, however, become more pertinent once the storm enters the Gulf, and so I will leave the topic until then. In the meanwhile the collection of oil from the cap seems to have returned to the status before the cap was removed. For the first 12 hours on June 24 (midnight to noon), approximately 7,215 barrels of oil were collected and approximately 4,040 barrels of oil and 27.2 million cubic feet of natural gas were flared. • and approx. 36.7 million cubic feet of natural gas were flared. However when the cameras on the ROVs are examined the picture is a little different from earlier. 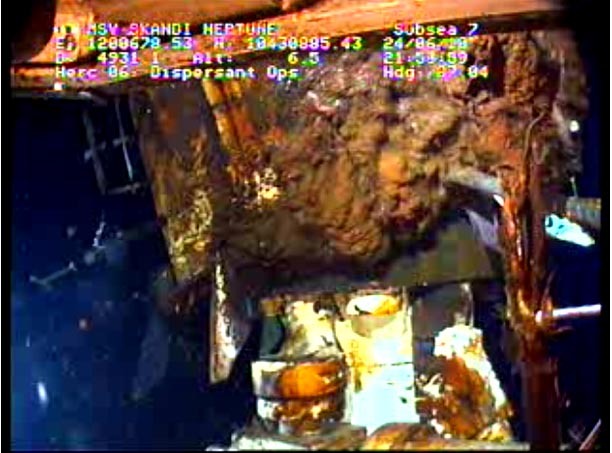 The camera on the Enterprise ROV2, for example at 9:50 pm is showing no oil leaking from under the cap. 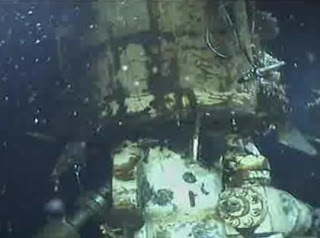 View of the cap 9:50 pm June 24, showing no leak on the Enterprise ROV side of the cap. 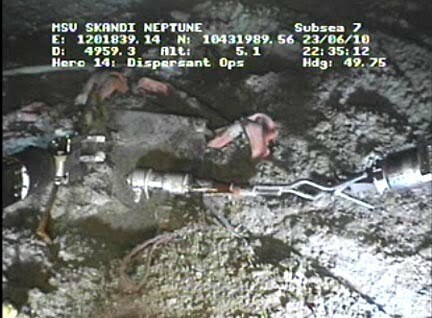 In contrast there is still some volume leaking on the Skandi ROV2 side of the cap – but the body of the cap can be clearly seen, suggesting that the draw-off of the oil and gas is reaching the totality of the flow. 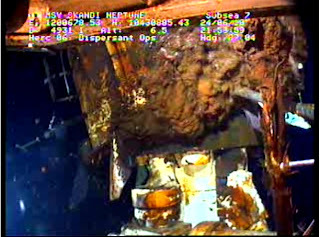 View of the cap and leak from the opposite side (Skandi ROV2) where the body of the cap can be clearly be seen, suggesting that almost all of the flow is now being captured, since the oil and gas leaking out are much reduced in flow. However both these views do not show what is happening at the top of the cap, where the vents are that allow oil and gas to escape from the top of the cap. But this suggests that the well flow is coming more under control, and that as the four new riser pipes are put into place, and more flow is extracted through the choke and kill lines, that the leak into the Gulf can be reduced to almost zero, which will then happen as the new cap is put into place next week. they're going to try and intercept somewhere around between 16,700 and 17,000 feet. We will confirm that for you and put out a statement tomorrow. They don't have to go clear to the reservoir, which is at 18,000 feet, and what they're going to do is they're going to close in and very slowly close to that point where they will then drill through the wellbore casing, and if they need to, drill through the pipe itself. But you are right; they'll be slightly above the level of the reservoir. And subsequently he talked about “ranging” to find the exact position of the original well. To do this the relief well has come in relatively horizontally and electrical pulses have been sent down the casing of the original well. I believe that the connections to allow this were being monitored by the Skandi ROV1 until earlier this evening when it moved away. Skandi ROV1 showing the electrical connections (lhs) to the plate allowing the electrical pulses to be transmitted down the casing. As the electrical current flow down the casing it will (as Faraday demonstrated, as you no doubt all remember from High School Physics – grin) generate a magnetic field around the path. By including the appropriate instruments on the relief well drill string, it is possible to therefore locate the original well with a much higher degree of precision than from the original dead reckoning of the well location. 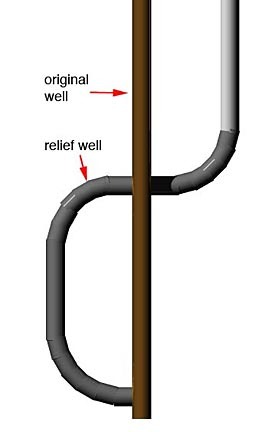 Once this has been done, then the well will swing back down to vertical and drill down until it is close to the desired depth, when it will again turn horizontal and drill over to intersect the well. At this point they hope to hit on the centerline of the casing so that they can mill through it, although should they be slightly off they can (as I noted earlier use penetrating charges to create the flow path for the mud to enter the well. On a lighter note I went over to the start of the solar car race today, and there was a little excitement, first the car from Bochum had a tire problem and could not leave the gate on time, and thereafter a second car had a problem just after leaving the gate. Much excitement for a few moments, and then the Germans had their car fixed and were away about 15 minutes behind the pack. The cars had made it to Alton by 2 pm, (first 5 cars in Michigan, Minnesota, Stanford, S&T, Germany.) but there was some problem with the road, because of earlier flooding. Following that check-point the cars have continued, with Missouri being close to Springfield, IL. There is a rumor that Minnesota has passed Michigan. Northwestern have yet to make Alton and are 260 miles from the next stage stop, at Normal, IL, which they need to reach within the 7 hours of racing tomorrow. They have had 80,000 suggestions - even just sorting these has taken a long time - getting good ideas up through the chain takes time.